We would like to thank everyone who has been generous enough to make a donation to the Irish Wolfhound Health Group. All proceeds go directly to the IWHG, which is a not for profit group and relies totally on donations made by individuals, the Irish Wolfhound Club's Health Fund and the individual breed bodies. Its work is totally dedicated to the promotion and improvement of health and education in the breed. or donate via Easy Fund Raising. A huge thank you to Mandy Addington for the fantastic donation of £1,489.71 from the Community raffle drawn at Crufts in March. Mandy, you're a superstar! Thank you also to everyone who generously supported the raffle donating prizes, buying tickets and making donations, we're very grateful to you all. On behalf of all at the IWHG, I'd like to say a big thank you to the team at DeWolf Dog Training for their fantastic donation of £596. DeWolf's volunteer team raise money from sales of cakes and blankets at their various courses throughout the year and at their annual charity quiz night. So thank you to all who dedicated their time and talents to raising this wonderful sum, it's hugely appreciated. DeWolf Dog Training is based in Uckfield, East Sussex and run training and socialisation classes for all breeds, sizes and ages of dogs. I'm delighted to report that the counting has been done and the IWHG raffle drawn raised the magnificent sum of £2,000! All tickets were sold, so thank you to everyone who purchased them helping us reach this remarkable total. The prizes on offer were outstanding, and we'd like to thank everyone who contributed, especially our patron, Trudie Sumner, who donated three fantastic prizes. Congratulations to Mandy Addington who won the star prize of a stay in a cottage in Wiltshire or a house in Grasmere donated by Trudie, and to all the other winners. A full list of prizes and winners can be found here. Thank you to all our fundraisers for another excellent few months of fundraising. We can’t stress enough how much we appreciate all our fundraisers and no matter how big or small, every donation makes a difference. Special thanks go out to Helen Ward for her donation of £400 from the sale of her beautiful Posh Collars and to Mandy Addington for the sum of £300 from the sale of Irish Wolfhound Community merchandise. The way you use your time and talents to raise funds and donate to the IWHG, the Irish Wolfhound Rescue Trust and PAWS is hugely appreciated. It’s been another excellent quarter for Easyfundraising donations which totalled £517. With the festive season just around the corner, what better time to sign up to Easyfundraising and let your Christmas shopping help raise funds for the IWHG. And the great thing is the donations cost you absolutely nothing! £72 was donated from loose change tins in the quarter, so thank you to everyone who continues to fill their coin tins. If you don’t have a tin, please contact Wendy Heather and she’ll get one to you. And don't forget, if have a tin that's been around for a while and might contain old pound coins, return it soon so that we can get them banked whilst they're still legal tender - you can always bring them to the Seminar on the 11th November. Thank you to everyone who gives by monthly direct debit, which is a great way to donate on a regular basis for the ongoing benefit of our breed. I'd like to take this opportunity to thank all our fundraisers for their continuing efforts and the fantastic work they do in raising funds for the IWHG. People give in many different ways, whether through Easyfundraising, loose change tins, personal donations, merchandise sales, or participating in raffles and auctions, and every penny is very much appreciated. 162 people are now signed up to EasyFundraising, which raised £459 in the first quarter of 2017, a fantastic figure and we would encourage anyone who shops on line to sign up here if you haven't done so already. Thank you to everyone who collects loose change in the tins provided by Wendy Heather, which has raised a substantial sum already this year whilst giving the counters an excuse to meet up, chat and eat cake when counting up the coins. If you don't have a tin but would like one (or yours is getting full), please contact Wendy and she'll get one to you. A quick reminder that old style £1 coins cease to be accepted by banks later this year, so if you have a tin containing any of these please return your tin to Wendy or one of the other committee members before the end of October. Personal donations by standing order are increasing in popularity, and we convey our gratitude to those who make regular donations in this way, as well as to those of you who make personal donations in other ways. We'd like to express our thanks to Mandy Addington for her unrelenting energy in raising money for the IWHG and the Irish Wolfhound Rescue Trust through her merchandise sales, whilst also providing a valuable service to Irish Wolfhound owners with an extensive range of branded items and customised clothing. A special thank you is also due to Helen Ward for her generous donations from the sale of her beautiful Posh Collars, which are available here. Thank you also to everyone who participates in raffles and auctions, whether as an organiser, donator of items, or as a ticket buyer or bidder - these really are a fantastic source of funding and are so well supported by all of you, so thank you. And finally, a thank you to all of those who contribute in other ways, in terms of your time, effort and willingness to get involved. On joining the IWHG as Treasurer, I was struck by the enthusiasm and commitment displayed by so many people in supporting the IWHG, something a monetary value can't be placed on but which is invaluable to the group. On Sunday 6th May 2017, Denise Pateman, Angela Parsons and Rebecca Peek met for a coffee, cake and counting afternoon. They opened eleven loose change tins and counted and bagged an amazing £658.82. Mandy Addington has just run another of her very popular raffles to raise funds for the IWRT and the IWHG, generating a total of £1045.44! The IWHG has received £522.72 for which it is hugely thankful. Mandy works tirelessly fundraising for us and is full of innovative ideas to get her group members to part with their money. Over the last two years the Irish Wolfhound Community Group has helped raise over £10,000 for the IW Health Group and Rescue - a staggering amount. Her Irish Wolfhound Community merchandising website continues to raise regular donations for us. If you haven’t discovered the Irish Wolfhound Community on Facebook, check it out - there’s lots going on. This delightful book has raised a wonderful £344.69 for the IWHG, a truly successful venture. Colleen’s tireless work raised a total of £689.37 in sales, divided between the IWRT and IWHG. A long-standing and regular fundraiser for the breed, Colleen started donating to the IWRT in the early 90s. We consider ourselves lucky and are very grateful that she has shared her beautiful artwork to support us as well over the years. Thank you, Colleen for your dedication to the breed. It’s amazing how all the pennies add up! 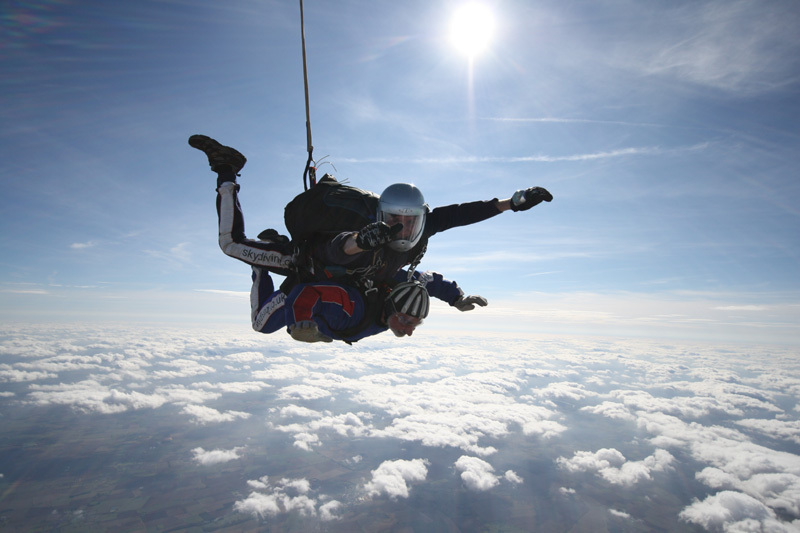 So far this year Easyfundraising has raised a whopping £1,368.61! Who’d have thought that you could raise money just buy buying what you already need, without having to pay any extra? Don’t forget to check out their website to set up reminders on your online searches and spread the word. This amount has been raised largely by a few people regularly shopping through the EF links. We are very grateful for their retail therapy needs! In May, the IWHG were invited to the EIWC Congress in Germany (for more info see News). At the gala dinner an auction was held with some very special Irish Wolfhound memorabilia for sale. With our superb auctioneer Chris Amoo, the audience raised a fantastic €935 for the Group in bids and donations. This translated into £742. A very big thank you to the lucky purchasers and to all who bid. Helen is a regular contributor to the Group through her very popular Posh Collars and we are very grateful for the generous donations she regularly makes. So far this year, she has contributed a whopping £450. Thank you, Helen. We’ve relaunched the Loose Change Challenge tins in the new IWHG livery. Thank you to Jean Timmins for that. They're a great way of making sure that all your spare coins go to a good home - you won't ever want to be without one! Tins can be collected from and returned to Wendy Heather at shows and events. To order yours in advance just email Wendy. We would like to remind everyone making donations and payments through PayPal to use the Family and Friends Gift option to make the most of every penny donated. Otherwise, PayPal deduct around 4% from each donation and heart test payment we receive. So far this year we have lost £34.46 in fees. The IWHG would like to thank Sharon Lake and her team of helpers who ran the "Long Nose Day" at Gainsborough, Lincs,on Sunday 14th June 2015. The Long Nose Day is a two day companion show, now in its 10th year and organised by the Lincolnshire Greyhound Trust. The Saturday is reserved for Greyhound only classes, but the Sunday is open to other breeds, with novelty classes and various other canine activities, such as giant dog agility, pet gundog scurry and speed jumping. This year the Lincs Greyhound Trust kindly put on both standard and 'fun' Wolfhound classes and all proceeds from the entries were donated to Irish Wolfhound Osteosarcoma Research through the IWHG. Thirty Wolfhounds, their owners and companions, joined in the party atmosphere and the organisers were stunned at the amount of money raised on the day from class entries, cake sales, the raffle and donations. Thanks to the huge generosity and level of support shown by those who attended, the amount raised on the day was an amazing £740. However, many who could not attend on the day, but still wanted to show their commitment to the cause, made donations after the event - and the final total was an astonishing £1347.50. Special thanks to the "A Team" - Ali Irvine, Amanda Brown and Andrea Joyce for working hard all day and huge thanks to all those who helped organise, took part, donated, made cakes, gave raffle prizes and generally contributed to making this event such a success. The IWHG is hoping to partner with Nottingham University in an exciting new research project studying osteosarcoma in Irish Wolfhounds. Whether this project goes ahead depends entirely on you! We need enough people to sign up to make the research statistically significant, if the census is not representative of a good proportion of the IW population then the research will be invalid. This is a large and far-reaching project and will need a dedicated and enthusiastic team of active and committed participants. A team from Notts Vet School are hoping to use a longitudinal study to look holistically at the occurrence of osteosarcoma. For study participants, this means dogs being swabbed and owners filling out an extensive questionnaire, and thereafter the owner filling out health updates regularly throughout the life of the dog. Should any of the dogs unfortunately then develop osteosarcoma, the study team are in the best place to concentrate research efforts on that specific dog. The research aims to study factors affecting the initiation and development of osteosarcoma, to identify markers which can be used in a screening programme for early detection of the disease, to review and optimise treatment protocols, and to identify novel treatment targets. We will need approximately 1000 dogs to participate, with owners who will engage with the research team and provide regular health updates. Ideally, these dogs need to be alive and resident in the British Isles (information about dogs who have unfortunately already died from osteosarcoma will also be appreciated). If your dog has already been swabbed by Notts Vet School, then you will only need to fill out the initial questionnaire and promise to fill out the regular health updates. If you are interested in being involved with this research please email me. The total raised for the IWHG from the Winter Raffle has now been announced as £2,032.66. An amazing total - and the IWHG would like to thank everyone who so generously donated prizes and all those who bought tickets. Special mentions and grateful thanks to Mandy Addington for doing a grand job of promoting the raffle through her Community FB page, to Liz Thornton for co-ordinating pre-Crufts ticket sales and who has now retired as our fundraiser - and last but not least to Marion Finney and her team of helpers, for giving up their time at Crufts to sell tickets all day. HEALTH GROUP SPONSOR'S STUNNING RESULT! The Health Group is delighted to announce that the first year sponsorship by Mrs Trudie Sumner has brought in a staggering £8,197 towards research into Irish Wolfhound health issues as a direct result of her support. The garden partY at Lake House was a resounding success, and the summer raffle, for which she provided the bulk of the prizes (drawn in October 2014 at the Irish Wolfhound of the Year competition) was extremely well supported. Our accounts are being audited and copies will be available at the clubs' AGMs as usual. The Health Group committee extends its thanks to Trudie, and to everyone who donated prizes, their time and the proceeds of their own events to our initiatives - not least, to everyone who bought tickets. Hopefully it won't be too long before we hit the £2,000 mark. Great work everyone - well done and thank you from all of us on the IWHG! October 2014 - The IWHG Big Raffle - the Results! This is the first raffle of its kind that we've undertaken to raise funds for the IWHG and what a great result! The response has been unprecedented with people buying tickets not just in the UK, but worldwide, and not just Irish Wolfhound owners, but many other breeds as well. We'd like to say a HUGE 'thank you' to everyone, who donated the wonderful prizes, but especially to our patron Trudi Styler, who donated the amazing first prize of a weekend for four adults in one of their guest cottages, in either Wiltshire, the Lake District or Italy - I'm sure we were all hoping to win that! But an even HUGER 'thank you' to everyone who bought tickets, you people are amazing - and so generous. The draw was made at the Irish Wolfhound Dog of the Year Super Match and all three judges, Irmgard de Haan, Mary McBride and Jim Behan did the honours for us. A great end to an excellent day. Mandy Addington's raffle of the Mary McBryde book "The Magnificent Irish Wolfhound" on the Irish Wolfhound Community Facebook page raised a remarkable £1,090! The lucky winner was Tracy Bracewell in Bermuda - a raffle with an international feel! Thank you to everyone who bought tickets and took part. 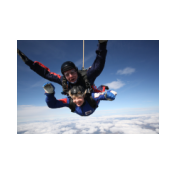 Mandy has also raised the fantastic sum of £210 from jewellery kindly donated by Anita Boyce. Many thanks to Mandy and to Anita. Thanks also to Alex Riva from Italy, who has donated a very generous £100 to the group, and to Sacha Dolling who makes a regular £10 monthly donation. Our thanks to Colleen Ellis of Fine Art Pastels by Colleen for so generously donating this stunning portrait of a five month old Irish Wolfhound pup in typically mischievous mood which was raffled at this year's Crufts. The raffle raised a staggering £735 for the IWGH pneumonia fund. 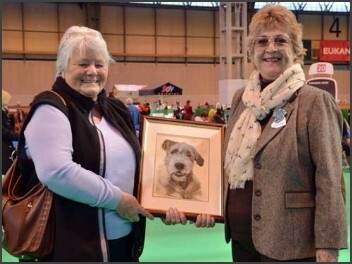 Thanks also to Judi Ferrbert for collecting and delivering the portrait to Crufts, to Mandy Addington, Jean Malley and John Sharpe for selling tickets and to all who bought them. The portrait was won by Rita Barrett from Guernsey, who by happy coincidence owns a litter brother of the puppy in the painting! Our sincere thanks to the following for their generous donations to the IWHG: Sue Bevis, Chris Broughton, Sacha Dolling, The Hon Mrs J Fane, Maggie Holder, Jean Malley, Julia McKendry, K Moore, Angela Parsons, Dagmar & Nick Pordham, Diane Redfern, Alex Riva, T Sumner, Liz Thornton, Jean Timmins, Anne Vaudin. The Loose Change Challenge (for which we provide a collecting tin for folk to take home and 'chuck in' their loose change.) Total raised to date for this period: £1,597.33! Thank you all! The Loose Change Challenge ran for a slightly longer 'year' this time to bring us towards the end of 2013 but I can tell you - with much respect to you all - that the amount you raised by chucking in your coins came to a whopping £1,393.59 which is just amazing. Thank you to everyone yet again, your participation is really appreciated. We are going into our third year and are hoping to have some of the 2014 tins available at the IW Club show in November for anyone to pick up if you would like to join us change-chuckers for next year. ANNOUNCING THE FABULOUS TIN TALLY TOTAL of £823.68 raised by all you lovely people. Thank you again everyone for making this possible. The total is for the year which so far has run between Club Championship Shows, but to bring us to a normal year starting in January we are keeping the tally going to December this year. The first Loose Change Challenge ran from April 2011 to 2012 and was an amazing success, raising a total for the IW Health Group Projects of over £1,200, which just knocked our socks off. Most of all THANK YOU to everyone who has contributed so far - you are brilliant! Many thanks to Debbie Treadwell for her kind donation of a rubber mat for use heart testing sessions. 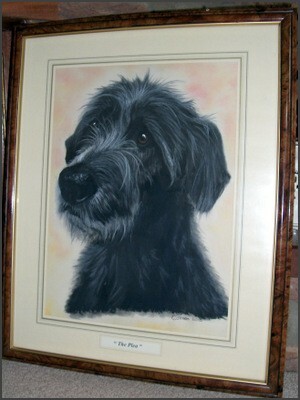 This wonderful pastel portrait, "The Plea", was kindly donated by artist Colleen Ellis to be raffled in aid of the Irish Wolfhound Health Group and the Irish Wolfhound Rescue Trust. This was done on 30 September 2012 at the Irish Wolfhound Society Championship Show, when a total of £240 was raised which was split between the two causes. The lucky winner of the portrait was Julia McKendry. Our sincere thanks to the following for their generous donations to the IWHG: M Hopkins, Sacha Dolling, Carla Du Rose, Irish Wolfhound Society, Irish Wolfhound Rescue Trust, Angela Parsons. 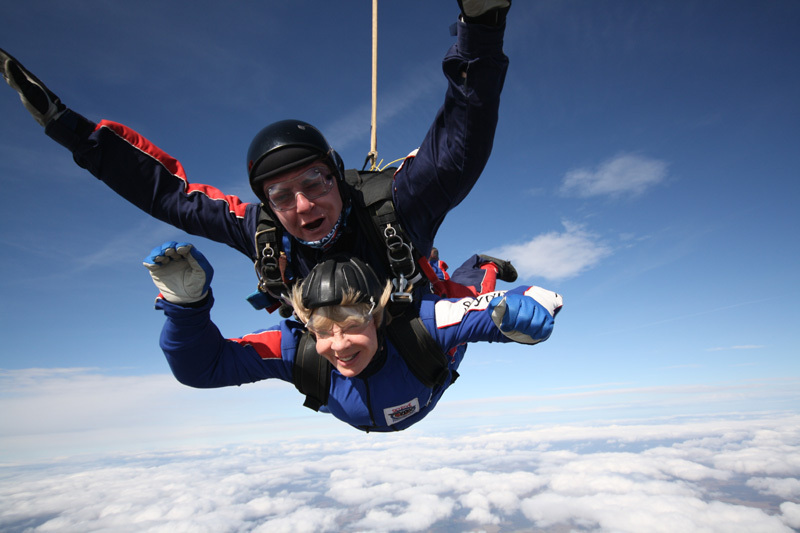 Intrepid Anne Wilson and Alan Lefley bravely completed a sponsored sky dive together in aid of the Health Group. 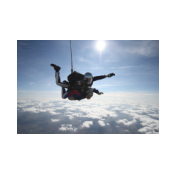 Their daring exploit, and the subsequent generosity of their many awe-struck sponsors, raised an amazing £3,000 which will be put to very good use by the group.